When the Cleveland Indians shipped C/1B Victor Martinez to the Boston Red Sox last July 31st, the club picked up LHP Nick Hagadone, RHP Bryan Price and RHP Justin Masterson. Hagadone was the long-term gamble, a post-Tommy John power lefty who’s struggling to find the zone in the minors. Price, a reliever, is dealing in the Eastern League. Masterson, meanwhile, was supposed to slot right into Cleveland’s starting rotation, anchoring a Tribe starting five no longer featuring the likes of CC Sabathia and Cliff Lee. 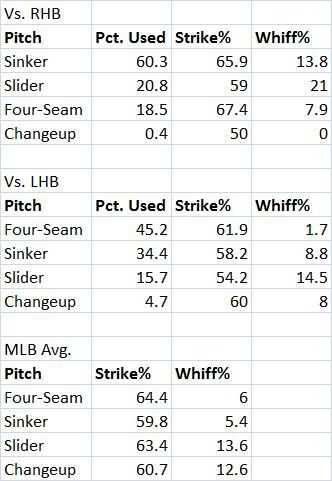 So far in 2010, Masterson has a massive discrepancy between his peripherals and his ERA. In 53.2 innings, the 25-year-old has 9.06 K/9, 4.53 BB/9, a 61.9 GB% and a 3.59 xFIP. Yet, his ERA is over 2.2 runs higher, at 5.87. That’ll happen when your BABIP is .404 — the next highest BABIP among starters with 50+ IP is Gavin Floyd, at .366. Masterson has also stranded fewer runners than one would expect (63.9%). But that’s not to say that the former Sox prospect is without flaws. Masterson’s talents are apparent — from a near-side-arm delivery, the 6-6, 250 pound righty throws low-90’s sinkers boring in on the hands of same-handed hitters and sliders catching the low-and-away portion of the plate. However, the same attributes that make him hell on righty batters leave him helpless against left-handed hitters. Against right-handers, Masterson jams hitters with his sinker or a harder fastball with less sink and horizontal movement (still sinker-like action, though the Pitch F/X system classifies it as a four-seamer and it does look like a distinct pitch). Or, he goes to the other corner of the zone with his slider, getting well above-average whiff totals with the fastballs and the slider. Versus lefties, he goes most often to that harder heater, but struggles to throw it for strikes and just about never gets a swing and a miss. He’s also having issues getting strikes with the slider. Currently, Masterson is owned in just four percent of Yahoo leagues. AL-only players who are willing to play matchups could extract some value here — green-light him against righty-heavy lineups and bench him against a team with multiple lefty thumpers. He’ll undoubtedly pitch better from here on out, but in order to be more than a vexing fantasy option, Masterson needs to find a weapon to give him a chance against lefties. We hoped you liked reading Justin Masterson’s Splits by David Golebiewski! How hard is it to get a changeup? Does it take months? a year? a couple weeks? Isn’t it just like a fastball except for the hold? Control (pitch location) is a huge hurdle for change-up development. The grip includes the use of more fingers on the hand, which is unnatural to many players. As far as the number of reps it takes to master? That’s player specific.